Starting Plan builds your brand from sketch to live, to communicate who you are. 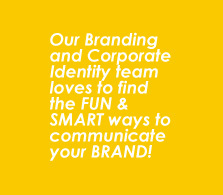 Our Branding and Corporate Identity team loves to find the FUN & SMART ways to communicate your BRAND! BRAND is not a logo, nor a fancy image or tagline. It is something more than that. Brand is a self identity – reflecting your company’s personality. It representing your company to achieve more in the future and differentiate your company with others. Starting Plan as your Brand and Corporate Identity Consultant understands this concept and brings you the creative ideas and satisfying executions for your company. Starting Plan defines your company as a unique idividual with certain identity and behaviour, with a glace of future development and vision of your company. Our Branding and Corporate Identity service includes: Brand Manual Design, Logo design, Brand Tagline , Business Card Design, Letterhead and Envelope design, Company Profile Design, Promotional Kits and Marketing Tools Design, Digital Company Magazine Design.